In 10-inch cast-iron or nonstick skillet, cook beef and onions over medium-high heat 6 to 8 minutes, stirring occasionally, until beef is brown; drain. Decrease heat to medium. Stir in taco seasoning mix, red pepper and chilies. Cook 1 to 2 minutes longer or until slightly thickened. Remove from heat; spread beef mixture into even layer. Meanwhile, in large microwavable bowl, mix cheeses and milk. Microwave uncovered on High 4 minutes; stir, then microwave in 30-second intervals until cheese melts and mixture is easily stirred smooth. Pour over beef mixture in skillet. Top with tomato, green onions and cilantro. Serve with tortilla chips. Serve with additional fresh toppings, such as hot sauce, sour cream, sliced jalapeño chilieschiles or guacamole. 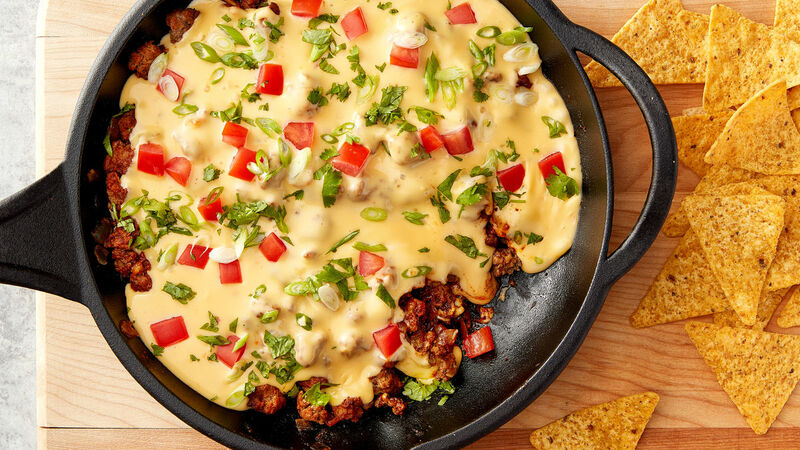 This dip can be made with ground turkey instead of beef.